Currently, this size marker (9" x 6") is the only one we offer on an individual basis. It is offered in the flush mount style flat with the ground (shown above), or in this upright style. 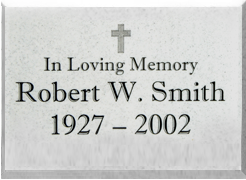 If you are interested in placing an order for a customized temporary grave marker, please download an order form HERE to send in the mail, or you can purchase online safely and securely with PayPal (below). Please keep in mind that in most cases a middle INITIAL will look better than a full middle name. 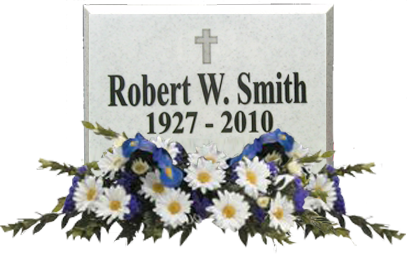 Note: Based on the information provided above, Beamer Products will create a custom temporary grave marker that is accepted by most cemeteries. Because each personal marker is a custom order, we do not offer refunds or credits.